Have you ever stood in your closet needing a little guidance on what to wear with what? Virtual Styling by Amy Giles might be just what you need to help you with your styling dilemmas! You may not be traveling to Churchill Downs for the most exciting 2 minutes in sports.... but it's always good to be prepared for a fun Derby party with friends... and know what to wear! It isn't all about the horses, right?!? When I think of the Derby..... Big hats and Mint Juleps come to mind. Kentucky Derby fashion has become as much about the race event as the horse racing. And.... HATS ARE DEFINITELY A MUST!!! Below, I put together 3 Kentucky Derby outfits for the Ladies and 1 bonus outfit for the Guys to help inspire you to dress your best for the race weekend! Like I said, it's a MUST! Whether simple or extravagant, you must make sure you have one perched atop your head! Fascinators are the hot new trend from across the pond - smaller headpieces worn on a headband or a comb. Princess Kate made this unique style "chic" a few years ago. If you choose a simple large brimmed hat.... consider adding fresh flowers, feathers, or netting... to make it your own. In my opinion, all ladies need to be in a dress. I feel like it's a Southern Lady TRADITION! Feel free to Show your unique style, but try to keep the silhouette simple and ladylike.... you would never want to distract from the THE HAT. If choosing a floral dress or print, keep your hat simple by choosing one color. If your dress is a solid color, feel free to go wild with several different colors! Keep it simple. Your Hat needs to be the "STAR" of your outfit. Stay away from big statement pieces and choose understated and delicate pieces instead, ie: simple cross or diamond necklace, or classic pearls and dainty earrings like studs or simple hoops. Also, your handbag needs to be small and simple - like a clutch. Make sure it can hold the following: phone, ID, credit cards, lipstick and lots of cash for placing those bets!! Chic summer open toe sandals, mules, classic wedges or an espadrille will be perfect with any dress. Make sure they are comfortable!! Even though the race is quick, the entire Derby event you attend might be an all day affair! Think classic preppy attire for the men. Traditional seersucker suits, or pants in different eye catching colors with a crisp white button up on top. Or classic khaki or navy pants and beautiful bright colored shirts. If your guy doesn't mind neck wear.... you can pull it all together with a bright colored necktie. Also, don't be afraid to let him don a 1920s style fedora style hat as well.... just as long as it doesn't take away from yours! I hope this has inspired you to wear your "Derby Best" with confidence on May 5th!! Don't forget to place your bets!! 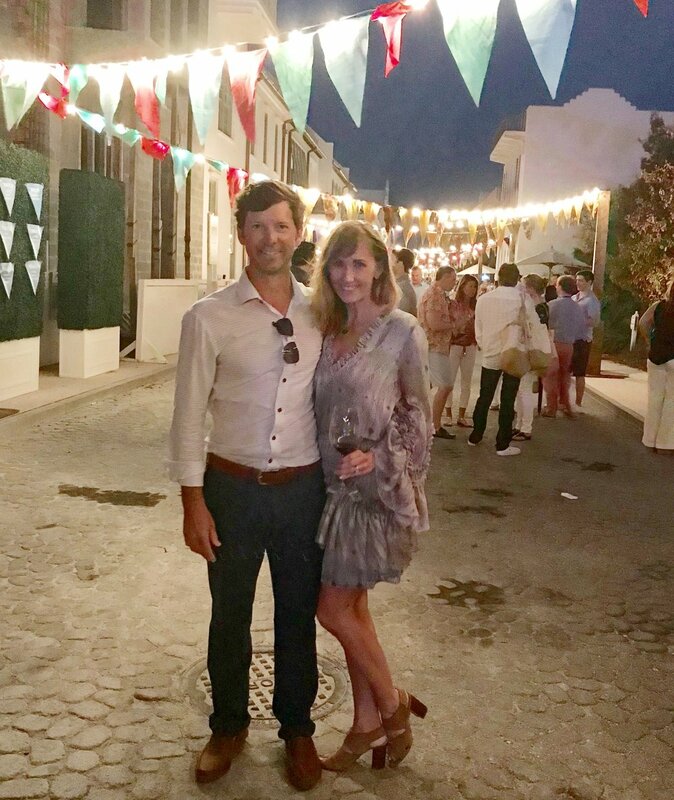 The 7th Annual 30A Wine Festival was an amazing event at Alys Beach! The weather thankfully cooperated and it was a beautiful weekend filled with wine, spirits, food, fashion & beautiful people! It is always a special event, especially to me, because of the beneficiary, Children's Volunteer Health Network. I have been involved with this wonderful local nonprofit organization for many years. It is heartwarming to see so many locals and out of towners support them and their cause to provide access to health services for children in Walton & Okaloosa counties in Florida. The fashion at the event is always on point, and I felt so perfectly dressed in everything I was wearing from The Alys Shoppe. It was the perfect place to find beautiful pieces for the entire weekend of festivities! I am sharing the highlights below from this fabulous fashion and wine filled weekend. Enjoy! The beautiful storefront of The Alys Shoppe. 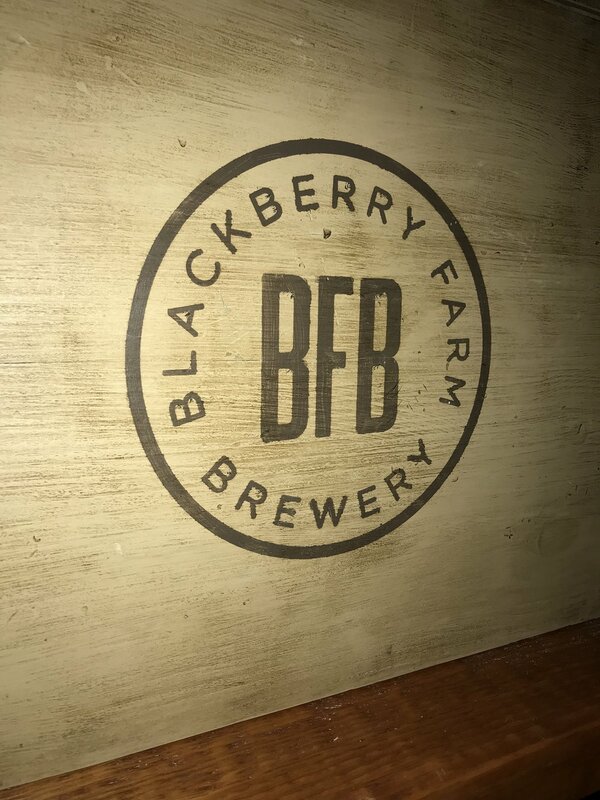 We kicked off our Friday evening February 23rd, at Bourbon, Beer and Butts and enjoyed live music, yummy food and.... obviously lots of delicious beer and bourbon! I stopped by to see the lovely ladies at The Alys Shoppe before the Grand Wine Tasting on Saturday, February 24th. These sweet, stylish women are always super helpful and ready to help find the perfect pieces for you! 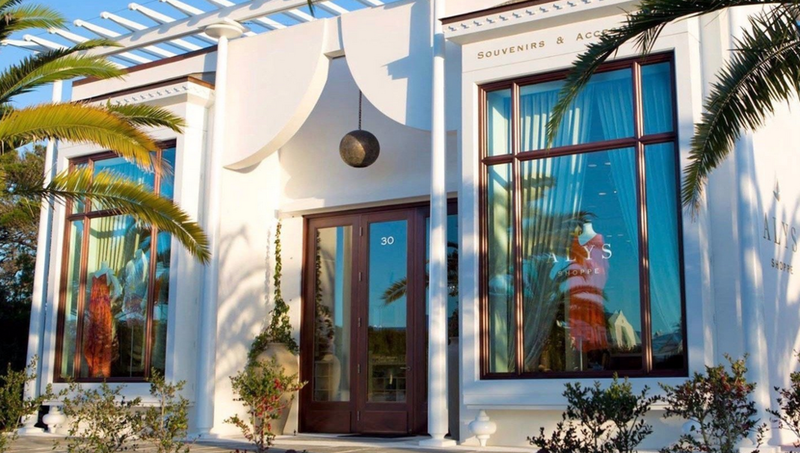 It was a glorious day to stroll the quaint streets of Alys Beach, tasting wine and food. My Dress, jewelry and handbag all from The Alys Shoppe. One of my favorites I tried that day! There is no other place quite like Alys Beach. Not a great quality photo.... but wanted you see these two parents had a fabulous time.... and I felt super stylish with my handsome date!! Love this display of the glasses when you walked into Rosè and Croquet. Lastly, Sunday, February 25th was Rosè and Croquet in the afternoon. This is such a classic, chic & stylish event. Everyone wore shades of white (the traditional color for croquet) and enjoyed a delicious brunch accompanied by rosè, champagne and creative cocktails . Who knew South Africa could make such delicious wines?? The place to see and be seen on 30A is Rosè and Croquet on Sunday! 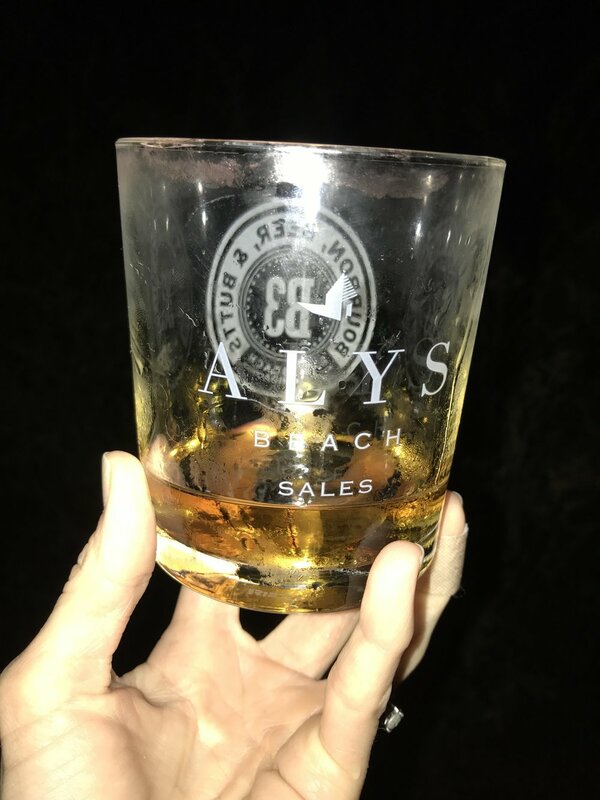 Feeling blessed to have been part of such a wonderful, chic event benefiting Children's Volunteer Heath Network... in such a breathtaking place, Alys Beach. Thanks again to The Alys Shoppe for making be feel super stylish and confident during all of the weekend festivities! Until next year..... Cheers everyone! For more information on Amy Giles and her styling & closet services, visit Wardrobe Made Simple. A few weeks ago, I had the amazing opportunity to co-host a late afternoon soiree with St. Joe Club & Resorts for a group of lovely ladies at the Watersound Origins Cafe. Guests enjoyed cocktails and hors d'oeuvres while enjoying a non-traditional fashion show. We were lucky to have two local boutiques there, Willow and Beachfolly, showing off their latest summer fashions. Two models from each boutique dressed in a beautiful day time look, floating around the room discussing their outfit details with the guests. We also had the honor of having Shelly Brown Jewelry there, showcasing her beautiful line of bohemian chic inspired cuffs and gorgeous jewels. This event would not have been possible without many many people making it all come together and beautiful! I would like to thank the following people: Photography by Jacqueline Ward Images, Morgan King (makeup) and Rachel King (hair), Flowers by Milk and Honey (gorgeous arrangements of flowers), Willow Boutique, Beachfolly, St. Joe Club & Resorts staff (Carly, Carolyn and Curtis) at Origins and my loved ones (my husband)! Wagma (Willow model) having her makeup done by Morgan King. Of course, fashion shows require hair and make up!!! What fun to host all of the models in my home pre-event! We had two amazing & talented ladies doing hair and makeup... Rachel Nelson on hair and Morgan King doing makeup. We were so blessed to have these ladies helping us to look event ready! Anne Hunter (Willow model) having her hair done by Rachel Nelson. (L to R) me, Shelly Brown, Anne Hunter and Allyson Longshore of STYLE STUDIO. I had the opportunity talk to our guests about my business, Wardrobe Made Simple, as well as discuss how we turned the model's day outfits into evening! Winner of my two hour evaluation giveaway, Chandra Whittington. My gracious, beautiful models. L to R -- Rachel Klager, Kathy Zellner, me, Wagma Permyakov and Anne Hunter. I couldn't resist stopping by Willow Boutique to meet Founder and Designer of the chic new jewelry line, Shelly Brown. Her American Made jewelry is self described as being "Bohemian Luxury". Her cuffs are fabulous and are made with Swarovski crystals with an array of mixed metals. Her collection is comprised of rings, earrings, necklaces and bracelets. The girls from The Southern Atelier (Sarah & Rachel), Beachfolly (Cameron) & me. All the girls are wearing Beachfolly attire and accessories! The Memorial Day weekend along 30A was filled with beautiful weather, family & friends fun on the beach and fashion for a cause. I was honored to have the opportunity to co-host a two day event with the beautiful girls of The Southern Atelier and Beachfolly, a precious little boutique located in Watercolor. We celebrated & talked about fashion in the south surrounded by gorgeous clothes & accessories, by Fine & Funky Jewelry. Also, since May is Lyme Disease Awareness month, we were raising awareness and taking the Lyme disease challenge. Did you know? Lyme disease is a world wide infectious disease and has been reported in all 50 states. Typically, Lyme disease is transmitted through a bite from an infected tick and only 50% of people will develop the bull's eye rash. Other common symptoms include fatigue, neck stiffness, pain, memory loss, headaches, joint pain and arthritis & jaw discomfort. To find out more information and raise awareness and hope, visit www.lymelightfoundation.org. During the weekend of festivities, I had the chance to meet some special people that photographed our event at Beachfolly. Jeremy & Amanda Jackson, with The Jacksons Photography. They are a precious husband and wife team based in the MidWest, (Columbus, Ohio). Call them if you are getting married in Columbus....or down here at the beach!! Amanda & Jeremy Jackson taking the Lyme Disease challenge. Picture of me pulling clothing for customers during the weekend. I'm wearing head to toe Chan Luu and Fine & Funky Jewels all from Beachfolly! My girls stopped by the photobooth at the event to be silly. Riley (left) & Cooper (right) - wearing Well Dressed Wolf dresses. Our sweet cousins came to visit us from Signal Mountain, TN. (L to R -- Hale, Rees, Cooper & Riley). My girls are wearing Old Navy Denim Shirt Dresses (they are sold out of this particular dress, but check out this precious Girls Denim romper from Old Navy.) and Mini Melissa + Capana Gold Jellies. We had a crew in town for the holiday weekend.....The Hamiltons (John's sister and her husband and kids) from Signal Mountain, TN., my parents (aka, Nana & Buddy) came in from Ozark, AL. and we also had John's parents who live here (aka, DeeCee & Granddaddy). We spent a lot of our time on the beach playing with the kids, drinking beach drinks and eating good food (it was beautiful, but very windy). I'm sad I didn't get a picture of all of us this weekend, though. John and me on the beach -- holding onto my hat! Wearing Tom Ford sunnies and Jenessa Leone hat- both from Willow Boutique. John wearing Maui Jim sunnies and his own Corestruction hat. Holly Williams (Hank Williams, Jr. Daughter) on stage jamming with her husband Chris Coleman, of Kings of Leon. 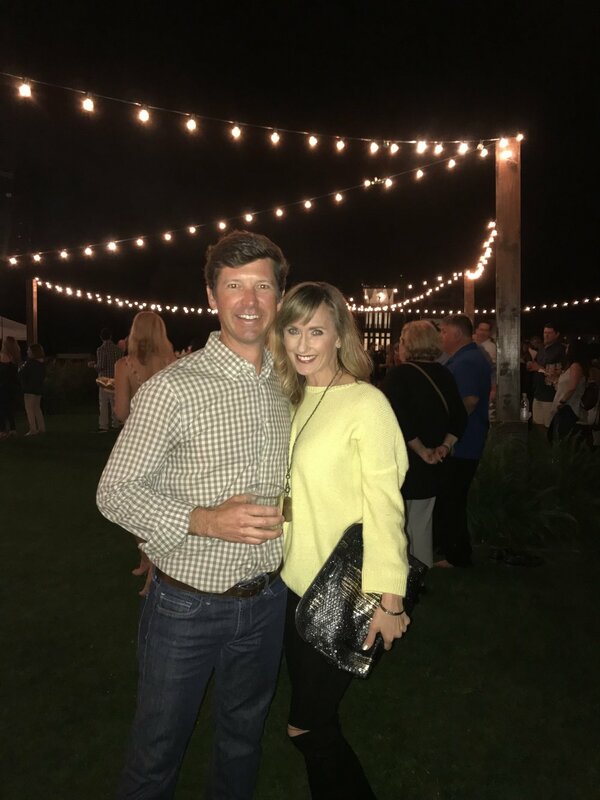 The weekend still kept going.... we got to see Holly Williams & her husband, Chris Coleman, in concert at Grayton Beer Brewery (very cool event) with The Hamiltons. We also had our dear friends, The Baynes, and their crew from Birmingham join us at the concert. Gulf Coast Sinfonia in Alys Beach. Cousins marching and honoring those fallen heros. Lastly we finished off the weekend with a beautiful concert under the stars in Alys Beach with the Gulf Coast Sinfonia.....remembering those who gave the ultimate sacrifice for our country and freedom. Thank you and God Bless. Cooper (left), Riley (right) and me at a photoshoot at Watersound Beach Club board walk for 30A Street Style. -Circa 2015. Amanda Sause Photography. I am thrilled to welcome you to my Blog! My name is Amy Giles and I live in Santa Rosa Beach, Florida (the beautiful gulf coast along Highway 30A) with my husband, John, and twin girls, Cooper and Riley. I just recently started my own business, called Wardrobe Made Simple. It’s a personal styling business, that offers an experience that can build confidence in the daily task of getting dressed! From wardrobe evaluations & closet clean outs to personal styling sessions and shopping trips…. I can help with anything to do with your closet and wardrobe!